Apple Music officially has more than 20 million paying subscribers. The Cupertino company just confirmed the milestone to MBW – and it comes less than 18 months after the streaming service launched on June 30 last year. 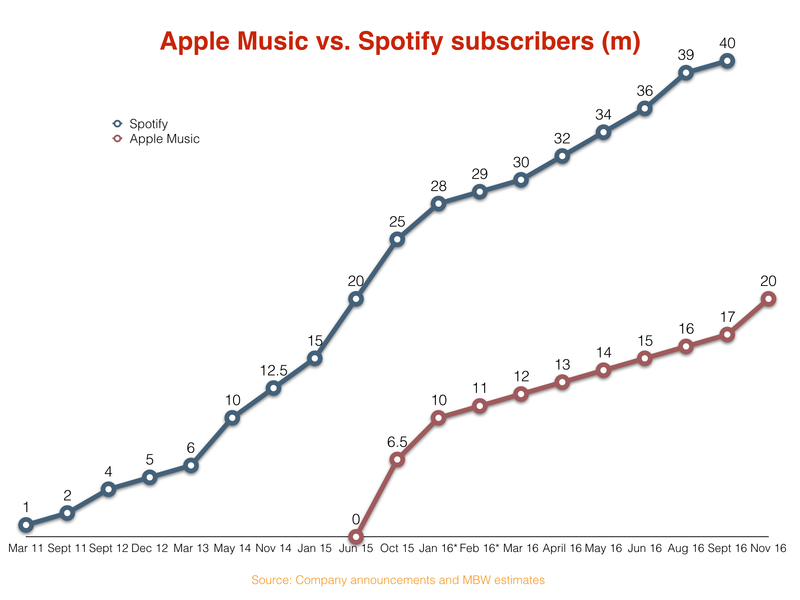 The next obvious question: how does Apple’s latest subscriber count compare to Spotify’s? In 2016 alone, Spotify has added 12m subscribers at last count (28m > 40m) while Apple Music has added 10m (10m > 20m). Apple would counter by pointing out that, after launching in 2008, it took Spotify seven years – until Summer 2015 – to reach 20m subscribers. Regardless, seeing two services attract over 60m streaming subscribers between them is promising – especially when you consider that, at the end of 2014, the music business counted just 41m paying subs across all on-demand services globally (source: IFPI). Apple’s latest update came amid the reveal of it ‘Best of 2016’ list, which highlights both editorial picks, as well as the top-selling + streamed Music, Apps, Games, TV shows, Movies, Books and Podcasts of the year.